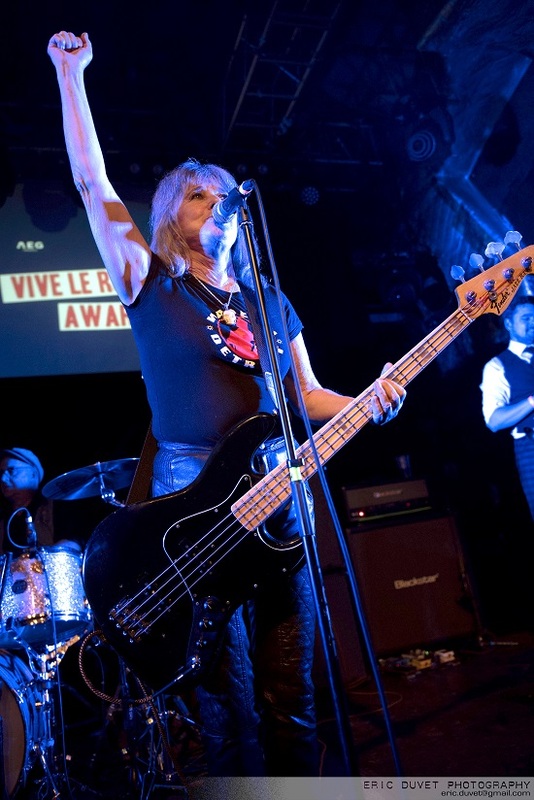 The annual Vive Le Rock awards built up a fearsome reputation after last year’s event. I wasn’t there then, so tonight I join in the chaos for the first time with anticipation and an open mind, without fully knowing what to expect. There’s plenty of awards to be had, and plenty of famous faces to be seen but in truth this is more about live performance than the awards which punctuate a packed evening of quality live music. 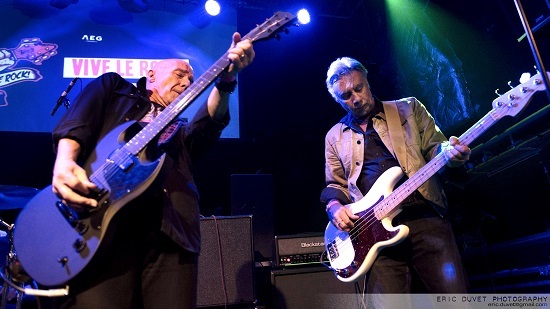 The first portion of the evening is dominated by original Pistol Glen Matlock who puts in an admirable stint warming the crowd up, first with the Vive Le Rockers house band, before bringing on the first ‘very special guests’ and surprising a few early birds with a Rich Kids reformation. A quality way to start for sure. With the inimitable Ed Tudor Pole acting as compere for the evening, the first round of awards sees Eddie & The Hot Rods’ Barrie Masters receive a very much deserved ‘Pioneer’ award from Rat Scabies, The Blue Carpet Band getting best new band, ANWL’s Animal presenting best reissue to The Vibrators, and most poignantly Pauline Black picking up the Roots award on behalf of The Beat’s Ranking Roger, who had tragically died the day before. Of course another tragic death last year was Pete Shelley, and Steve Diggle receives an award on behalf of Shelley from Penetration’s Pauline Murray before the two team up with the house band for a run through ‘What Do I Get’, which Murray handles particularly well, with Diggle taking over for ‘Harmony In My Head’ and ‘Ever Fallen In Love’, which he struggles to keep up with. Madness’ Lee Thompson picks up best film award for ‘One Man’s Madness’ but seems to get rather ignored by the audience, none of which have actually seen the film by the looks of it and Idles pick up best album but can’t be there as they’re on tour, and a technical hiccup means their video message isn’t seen either. Steve Grantley picks up best live band for Stiff Little Fingers, Kim & Jackie from Girlschool pop up to proudly present Suzi Quatro with ‘Icon’ and Jaz Coleman gives a suitably eccentric performance for Killing Joke’s ‘Maverick’ award. The crowd’s attention seemed to pick up as Suzi Quatro had picked up her award, and indeed she gets a rousing reception as the live music picks up again with her knocking out a belting version of Chuck Berry’s ‘Sweet Little Rock’Roller’ with the house band, before Barrie Masters gives what is billed as his final solo performance in style, treating the crowd to the Hot Rods’ ‘Teenage Depression’, ‘Do Anything You Wanna Do’ and Bob Seger’s ‘Get Out Of Denver’. Things are really warming up now as the night reaches its climax, and Ed Tudor-Pole, who it must be said handled his compare duties extremely well amid all the chaos, gets his deserved moment to shine with a stonking double dose of ‘Who Killed Bambi’ and ‘Swords Of A Thousand Men’. Shine he certainly did. With all the awards and guests wrapped up the stage is cleared for the evening’s climax of the ‘secret’ star band to wrap the evening up. 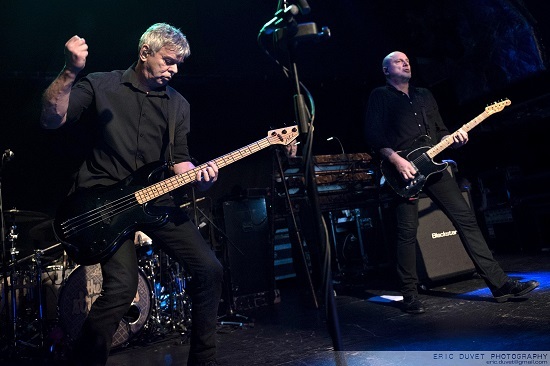 Prior to the event, speculation had been flying around as to who the band would be with SLF, Ruts DC and even Generation X being rumoured and I must admit that it wasn’t until I turned up this evening that I found out it was actually the Stranglers, which made this Stranglers fan one very happy man. They receive a ‘band of the year’ award from Ruts DC’s Segs and Dave Ruffy, which seems to amuse JJ Burnel a great deal. They plug in and proceed to blow the whole place apart, with a 30 minute, six song, succulent slice of brilliance as ‘5 Minutes’, ‘Tank’, ‘Unbroken’, new one ‘This Song Won’t Get Me Over You’, ‘Grip’ and ‘No More Heroes’ are unleashed in quick succession. Its perfect way to wrap up a thrilling night full of fun, famous faces and great live music, with, in true punk rock tradition, a touch of chaos too. PHOTO CREDIT: Photos © Eric Duvet.